I had dinner with the family and a family friend at a Taiwanese restaurant near home. This place has several appetizers that are typically sold as street food in Taiwan. We had a few dishes I’d never had before, thanks to the family friend from Hong Kong who is more knowledgeable about Taiwanese food than my parents are! We had Taiwanese stir fried rice stick noodle, or “tsao mi fun” in Mandarin and “tsa bi whun” in Taiwanese. 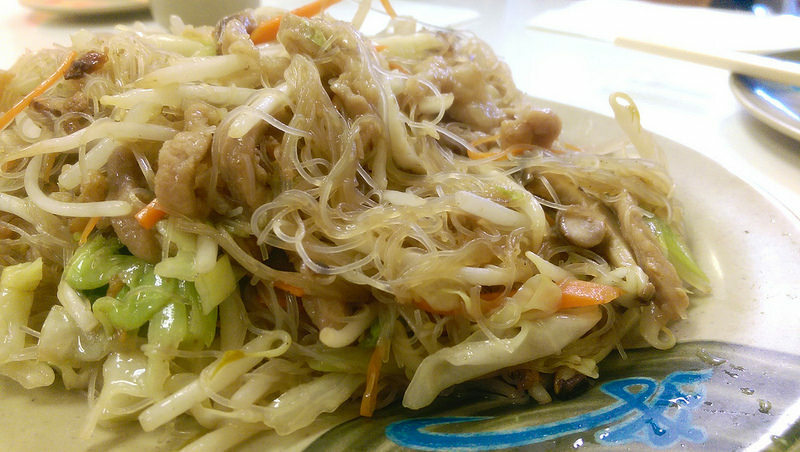 Chou Ma Ma’s dish had rice stick noodles, Chinese cabbage, pork, bean sprouts, carrots, and onion. As with most Chinese stir-fried dishes, the ingredients may vary but the rice stick used is Taiwanese. Tsa Bi Whun is the taiwanese way of saying it! even I can’t master how to say it!